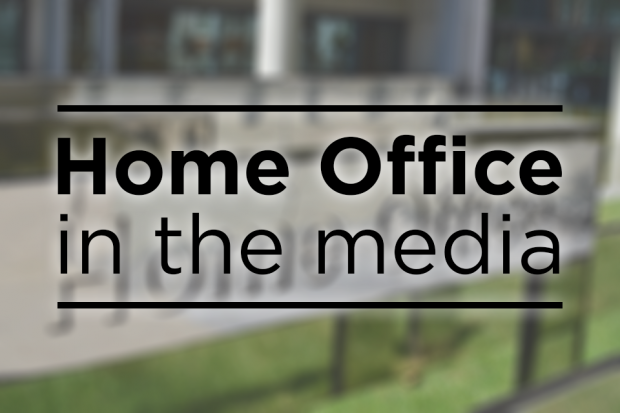 Today's Home Office related news includes coverage of the Home Secretary's appearance at the Joint Committee on the National Security Strategy yesterday. And see Brandon Lewis's video message to the LGA Fire Conference in Newcastle. There is coverage of the Home Secretary’s appearance in front of the Joint Committee on the National Security Strategy as Chair of the National Security Committee in the Telegraph, Daily Mail and The Sun. The Home Secretary’s comments on recruitment to the armed forces lead the coverage but the Telegraph reports her comments on security co-operation with other European countries after the UK leaves the EU. A Home Office statement on this issue can be found below. Journalists interested in information about recruitment to the armed forces should contact the Ministry of Defence. We’re clear that we’ll do what is necessary to keep our people safe. The Prime Minister has clearly set out that one of her 12 negotiating objectives is continuing to work with the EU to preserve security, to fight terrorism, and to uphold justice across Europe. As part of the negotiations, we will discuss with the EU and member states how best to continue cooperation on security, law enforcement and criminal justice. Also on 7 March, a pre-recorded video message from the Minister for Policing and the Fire Service, Brandon Lewis, was played to representatives from across the fire sector at the Annual Local Government Association (LGA) Fire Conference in Newcastle, updating them on the next steps in the workforce reform programme.